Most businesses start with a marketing site and product in one language, but there’s a whole world of people out there who get ignored if your business never expands beyond that. The obvious solution is to support more languages. Doing so can open growing businesses up to new audiences and help them start to build a global footprint, but it’s less obvious how a single-language company can set off getting there. At Intercom, we got along for a good long while on English alone, but we recently decided to branch out and see if we could do even better by adding a few new languages to our repertoire. Below are some of the things we learned along the way. When should you consider localization? There were several factors that drove us to consider expanding into other languages. At the highest level we saw that we had a fair number of visitors from non-English speaking countries visiting our English marketing site, and we also had a fair number of paying customers in those countries. 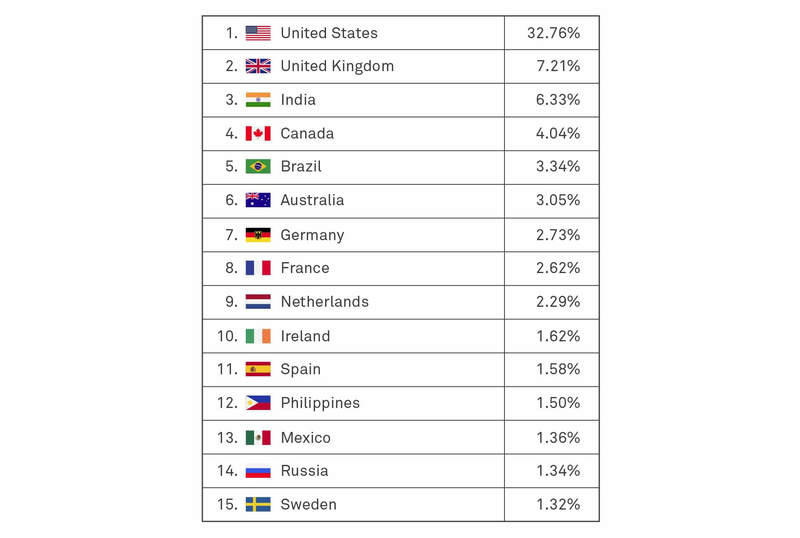 And our paying customers by country mirrored that organic traffic almost exactly. Both of these metrics are a good place to start when considering whether or not it’s time to branch out into new languages and which languages you should be targeting. If you’re seeing a large part of your traffic come from areas that don’t speak your company’s primary language, that’s a pretty good indicator your company could benefit from localization. If you already have paying customers in those countries, even better! There’s existing demand and you can likely tap into much more by providing a local language experience to those users. The good news is that it’s relatively easy to pull this data together. We checked our visitor volume in Google Analytics, and we looked up our customer data through a quick set of filters in Intercom. For us, the above data was enough to merit a quick experiment to see how much additional local-language demand we could access by offering localized experiences for non-English speakers. We set up a quick paid experiment for our “cupcake” version of localization. We took our highest performing English keywords, ads and landing pages and localized them into 5 target languages: French, German, Spanish, Portuguese and Japanese. We selected these languages based on organic traffic volume and the value of existing customers with their browsers set to those languages. We then ran localized and English campaigns in countries that spoke our target languages. The biggest hurdle to getting this experiment setup was finding a localization agency we were confident in. There are many services that will translate your content, but getting a high-fidelity reproduction of your source content in multiple languages is tricky. We wound up going with a large localization agency and were happy with the results, but there are lots of good options out there. The most important thing is to get a native speaker of your target language (ideally someone within the company who understands your company’s voice) to review and put their stamp of approval on the output. The chart above is a comparison of impressions and visits in each of our target geographies between localized content and English content. Localized content far outperformed English content, which makes sense. In general, French speakers in France are more likely to engage with French content rather than English content. When we looked at how much it cost us to acquire leads at the top of our funnel, localized campaigns were slightly cheaper than our general English paid campaigns and significantly cheaper than the English campaigns we ran in our target regions. Again, this makes sense — Portuguese ads in Brazil are more likely to be relevant than English ads, and therefore more affordable. This was one of the most influential takeaways of the experiment. With the first two examples, we learned that we could acquire new traffic at a lower cost by localizing content. What the above chart shows is that visitors from localized campaigns converted at similar rates to our English traffic throughout each stage of our funnel, where the funnel was localized. Not only could we acquire new visitors with localization, those visitors were of similar quality to our English traffic. As a result of the experiment, we felt confident there was demand for Intercom in these regions, and that we could tap into it with a localized experience. Based on these findings, we expanded our localization efforts across our marketing site to make it available in French, Spanish, German, Portuguese and German, as well as into our onboarding flow and into our product education content. Our product is currently only available in English, but customers can set the primary language of our messenger and our Educate product to a host of different languages, allowing them to interact with their customers in their language of choice. It’s early days for localization at Intercom, but the initial indicators are positive. We’ve seen an increase in paid and organic traffic across the board and the further down the funnel we localized, the better the localized conversion rates have been. One big question for most companies will be deciding if you should start by localizing your product or by localizing your marketing site. The decision will vary from business to business, but if your customers don’t understand your product, it doesn’t matter how well localized your marketing is. 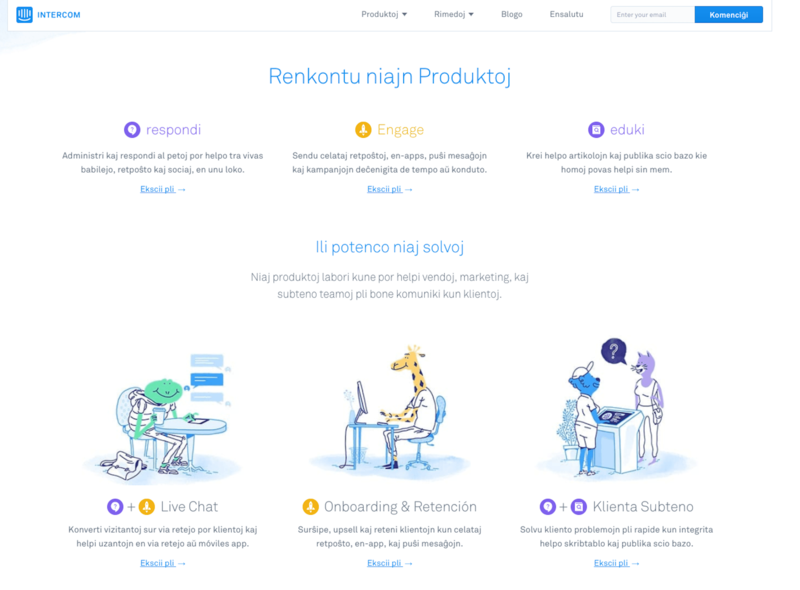 For us, a hybrid of localized marketing and making sure our non-English customers could interact with their end users in their primary language was a good starting point. Regardless, marketing teams can easily set up a quick experiment like ours to test for top of funnel demand even without a localized product. None of our test results are really that surprising when you think about it. For every potential English speaking customer your business has, there are likely many more who speak German, Portuguese or Japanese. It’s not that they aren’t interested in your product, it’s that they don’t know what your product is or does. For every prospect searching for “customer service software,” there are others searching for “kundendienst software,” “software de atendimiento ao cliente” or “カスタマーサービスソフトウェア.” Connecting with those prospects isn’t impossible, but it does take some planning and doing to get your product showing up on their radar. At Intercom, we’re all about making internet business personal. In a lot of ways the first step to making your business personal is speaking your customer’s language.